Hello folks, may I ask how you go about hinting small glyphs like Threesuperior and Registered, for them to not jump up or down in the middle part of the glyph? Should I make a hint that goes all the way from bottom to middle horizontal stem of Threesuperior, for example? Or are ghost hints/stem hints enough? More on this: should a Period have stem hints or ghost hints? I've seen both. For PS style hinting, you would just assign a regular horizontal stem hint across the middle stroke of the superior 3, just as you would for the full size 3, and rely on the rasteriser to do the best job it can at the given output size and resolution. You can control the bottom and top alignment of the superior numbers with appropriate blue zones, but anything between these zones will float, and you can only hint the thickness of the strokes, not their position. In TT hinting, you have a lot more control. You can assign an interpolate instruction to the middle stroke of the superior 3, which will do a good job at most sizes of keeping it near where you want it, and of course you can delta it up or down at specific ppem sizes. as John mentioned, TT Hinting you might do something like the following. note, there is more that could be done here, but this shows the interpolate to the middle. note that to keep the glyph perfectly legible, you may have to force the height to be 5 pixels. Thanks, Mike. Whilst we're on the subject of hinting, am I right in thinking that VTT is still the only tool that writes ResY instructions? Have you seen this output from any other tools yet? Glyphs has something similar to ResY instructions, you can choose for each aligned point if it should be rounded always or just in ClearType/GDI. There should be an image here, which is not displayed in my browser, that’s weird. If you can see it, the switch is the "A" in the hinting options bar. Thank you all for the insight. I wonder why Fontlab makes what looks like automatic positional PS hints on some of these and other glyphs, like cedilla. They may incorporate the whole width of the glyph, for example. And in Registered it makes a hint between the top of the glyph and the middle horizontal stem of the R.. If you're using FontLab's (Studio 5) own internal PS autohinting, you need to set the preferences for it to be appropriate to your typeface design, setting minimum and maximum hint widths and, sometimes, also the settings for minimum stem length to be hinted. 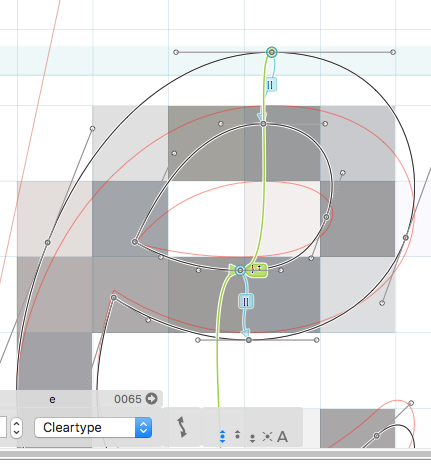 In FontLab VI, you have the option to use Adobe's autohinter directly within FontLab. Ok I guess it´s preference thing In FL5, but still strange that it autohints stuff that's not stems, but total width of glyph.. Thanks. The FLS5 autohinter has trouble identifying stems if the preference settings are way off for the design. It looks for parallel outlines segments within the minimum and maximum distance settings. 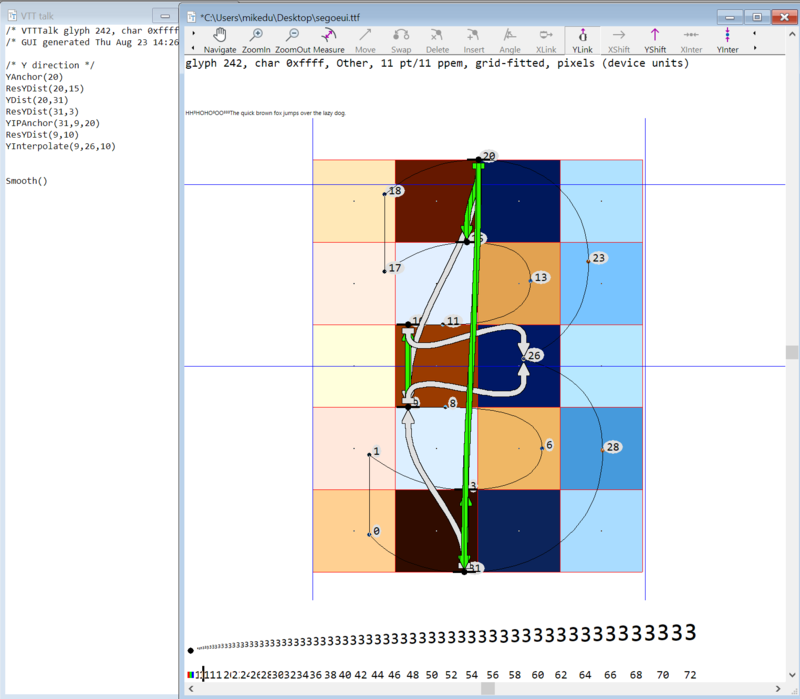 For many years now, I've not bothered doing PS style hinting within FLS5, but instead just set the blues values and standard stem measurements there, export the font, then run Adobe's autohinter on it.